Lord Shiva is one of the prime gods in Hinduism. According to Puranas, Lord Mahadev is the destroyer, Lord Vishnu is the preserver and Lord Brahma is the creator. Shiva god is one of three gods among Trimurti including Lord Vishnu and Lord Brahma. Lord Shiva has one unique appearance that is something like having matted hair, snake around the neck and Goddess Ganga on the head and three eyes. 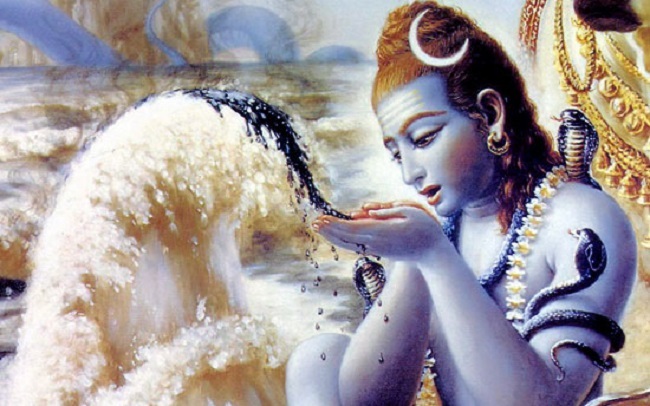 For above all the names, each name holds one unique story explaining why Lord Shiva is calling with that particular name. So today we are going to discuss the name Neelkanth and why people call Lord Shiva as Neelkanth Shiva. Neelkantha means a person having a blue throat. You can generally see the Lord Shiva's throat is in a blue color that's why he is called as Neelkantha. But How did he got that blue throat?????? For this question, there is a story. So let's go into the Neelkanth Mahadev story. Actually, this story starts with the fight between Gods and the Demons. It was a time where Gods and Demons both wanted nectar or amrita, which offers an immortal life for those who drink it. So they wanted to churn the ocean and to get nectar from the bottom of the ocean. This process of churning an ocean is called Samudra Manthan. In our Puranas, Samudra Manthan was one of the main episodes. So Gods and Demons have started the churning of the ocean. While doing this Samudra Manthan, they did not get directly amrita from the ocean. In the initial phase of churning, some goddesses had emerged from the ocean. They were goddess Lakshmi, goddess Varuni and some more Apsaras. After that, some animals like Kamadhenu and Airavata had emerged. In the next phase, some valuable things like Parijat, Kaustubha had emerged and also Dhanvantari had emerged. After some more time, they emerged one deadly poison named Halahala. This poison was very dangerous and can give death to those who would make contact with it. Demons and Gods were terrified and they were in danger of death because of that deadly poison. Then both Devas and Asuras turned towards Lord Brahma for help but Brahma made them go to Lord Vishnu. After knowing the situation, Lord Vishnu told them to seek the help of Lord Shiva because he is the only one in this universe who can save you from this situation. So all Asuras and Devas prayed to Lord Shiva. Lord Shiva was pleased and came up to help them. Lord Shiva had the only choice that was nothing but swallowing that poison because if it was on the earth then it will be dangerous forever and one more thing was Lord Shiva had enough power to swallow that Halahala and also to digest it. So Lord Mahadev started swallowing whole deadly poison. By seeing this situation, Goddess Parvati turned into Mahavidya and stopped the poison at the throat of Lord Shiva because if poison would enter the stomach of the Lord Mahadev then the whole universe would be destroyed because Lord Shiva has the whole universe in him which contains humans, creatures, animals and plants and etc. After Goddess Parvati stopped poison at the throat of Lord Mahadev then his throat started turning into blue colour. Due to this Halahala, Lord Shiva has the blue neck. Blue throat of Lord Shiva stands as a symbol for the negative thoughts and evil things in human beings lives. Neelkanth god shows how to control negative thoughts in your life and how to protect your good and beautiful life with good thoughts because good thoughts always show a path to your goals and bad thoughts always shows an end to your goals and life. There is one Neelkanth Mandir in India which shows us Lord Shiva in the form of Neelkanth. This NeelKanth Mahadev temple is located nearby Rishikesh in the Pauri Garhwal district and in the Uttarakhand state. So, readers, this is Why Lord Shiva Is Called Neelkanth and is having a neck with a blue color. Pray the god always in your life and be in the grace of Lord Mahadev and be happy and wealthy.